I’ve been burning through projects lately but none of them having anything to do with my 3o Before 30 list. The baby prep has really started to take over and she wasn’t even on the 3o Before 30! 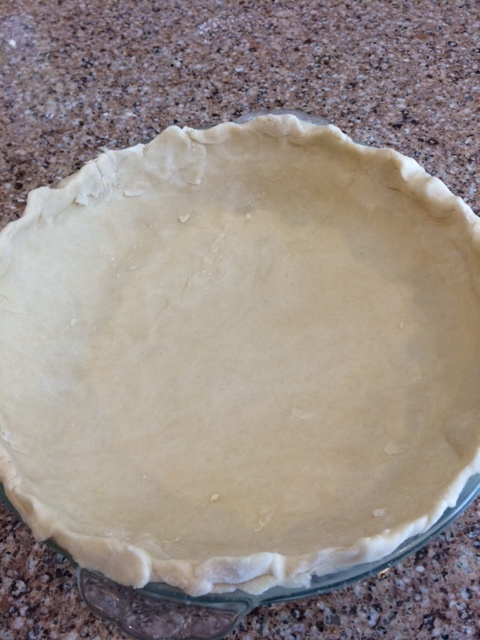 Thanksgiving presented the perfect opportunity for me to complete #16 – Bake a Pie From Scratch. I decided to wait until my family’s Thanksgiving which is celebrated the Saturday after. I haven’t subjected my in-laws to my random baking experiments yet. I am sure they would be more than willing, but I know I will get very honest feedback from my parents, brothers, and sibling-in-laws. 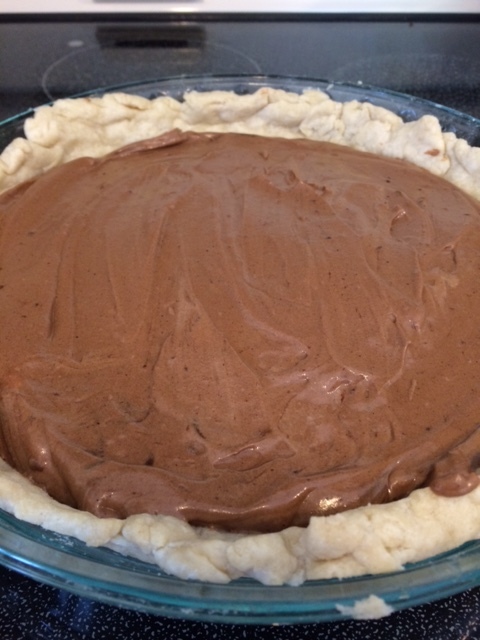 With that said, I set out to make a gluten-free pie from scratch yesterday and settled on a French Silk Pie. I have never been a huge pie person, mainly because I am not a fan of the crust or baked fruit, so I figured as long as the filling turned out it should taste decent, right? 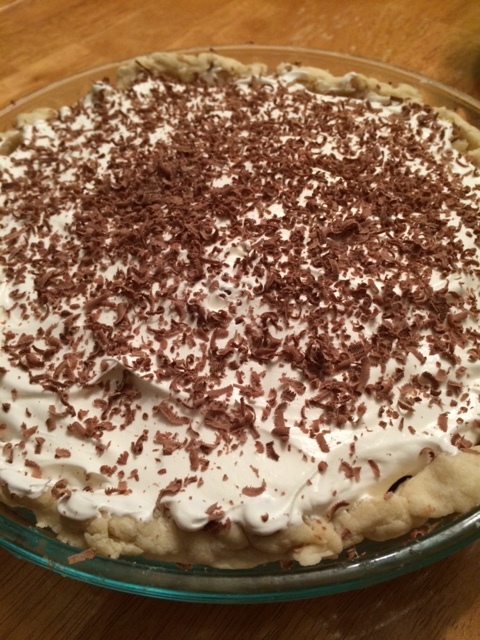 I did my research, and by research I mean I pinned a few recipes for gluten-free pie crust and then Googled French Silk Pie in the grocery store on a whim to make sure I had all the necessary ingredients. Then I just went for it and here is how it turned out. I followed this recipe and this recipe for the crust. I used the Namaste All Purpose Gluten Free Flour, a stick of butter, five tablespoons of ice water and a small spoonful of sugar. I mixed everything by hand which made quite the mess, but I don’t think it would work very well otherwise. Especially since you are using cold butter. Most of the recipes I checked out recommended that I refrigerate the crust for at least an hour and many did it overnight. I didn’t have the overnight option (hello, procrastinator) so I refrigerated for just over an hour. Most recipes also recommended you take it out for about 10-15 minutes before rolling. 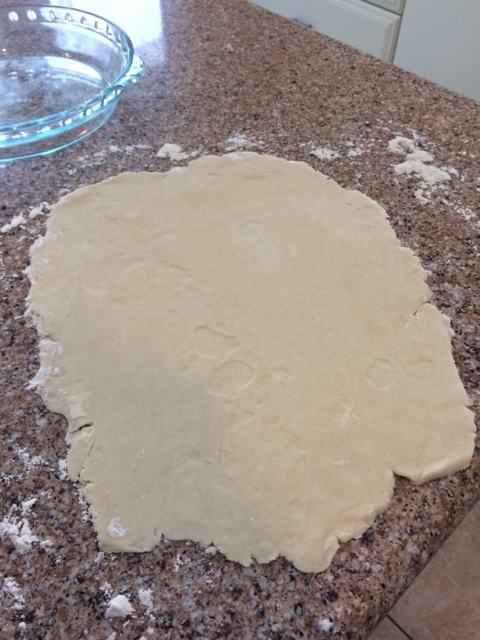 The rolling out was a little difficult and required a little more effort since the dough wanted to fall apart. I rolled it out more than once and then re-balled with my hands to make it feel like a more consistent product. Eventually, I made it look semi normal. I sprayed my glass pie pan with coconut oil just to ensure the crust didn’t bake directly to the pan. I wasn’t sure if I should have but did anyway. I also didn’t have a pie weight or any other fancy pie baking tools many of the recipes called for. I just rolled the crust on a counter top full of gluten-free flour. Once it was baking at 350 degrees I watched it closely. I first set my timer for 10 minutes and then an additional 10 minutes. Once it appeared to be done (it wasn’t very golden brown but when I poked with a tooth pick it seemed done) I took it out and let it cool. Then I started the pie filling. In the end, it actually looked like French Silk Pie filling. I had Justin test it and he said the filling tasted great! I put it in the fridge until we were ready to go to my parents and then left it outside (yay for MN becoming an outdoor fridge/freezer) until we were ready to eat it. I topped with Cool Whip and shaved some frozen Dove Chocolates over the top before serving. Everyone who consumed it said it tasted great. I totally agreed with them too. Even my picky little brother who is also gluten-free liked it! And I think I saw my husband having one of the few leftover pieces for breakfast this morning! Did anyone else try some fun recipes for the first time for Thanksgiving? Do you ever buy some sort of kitchen gadget because you feel like you MUST have it, only to have it collect dust and you basically never use it? 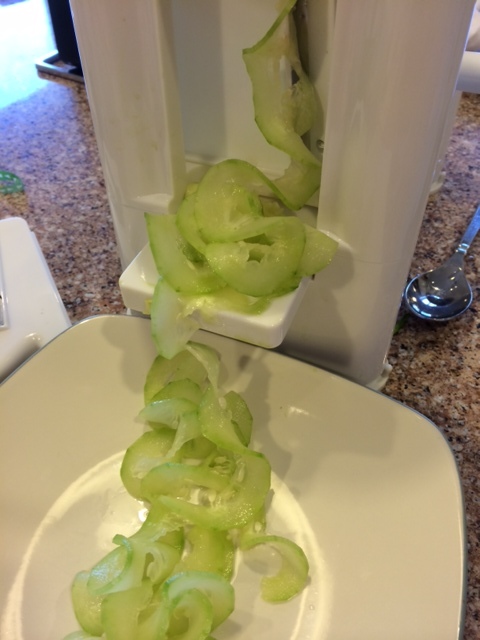 Well, I have definitely done that before, and Justin saw the writing on the wall when I asked for a spiralizer! Little did he know how much I’d actually LOVE it! About two weeks ago we went to Williams-Sonoma to finally spend a gift card we received from his brother and sister-in-law for Christmas. We LOVE Williams-Sonoma and always have so much fun realizing the possibilities for our kitchen. However, we aren’t exactly the high rollers I often wish we were and sometimes things just aren’t in our price range. With the gift card in hand we were set on finding a new, non-stick pan. We invested in All-Clad when we got married, which we love, but they aren’t always the best for just frying up an egg and can be a real mess to clean up. Once we found what we were looking for (a three-piece set on sale!!!) 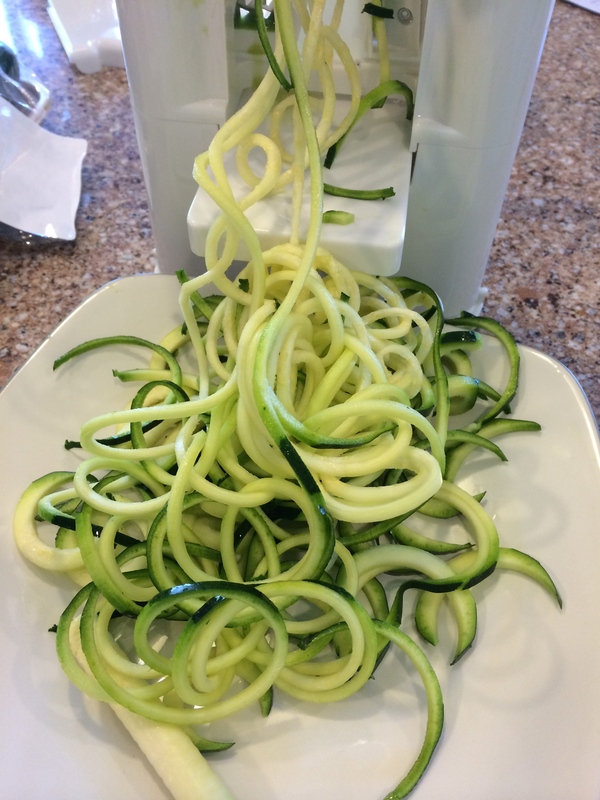 I went on a mission to find the spiralizer of my dreams. I saw it in one of their mailers and knew I had to have it. However, Justin was quite skeptical. I think he assumed it would take up space and get pulled out once in a blue moon. Sometimes he just has to hear how amazing it would be from someone else, and when the sales gentleman said how awesome it was, he was sold! 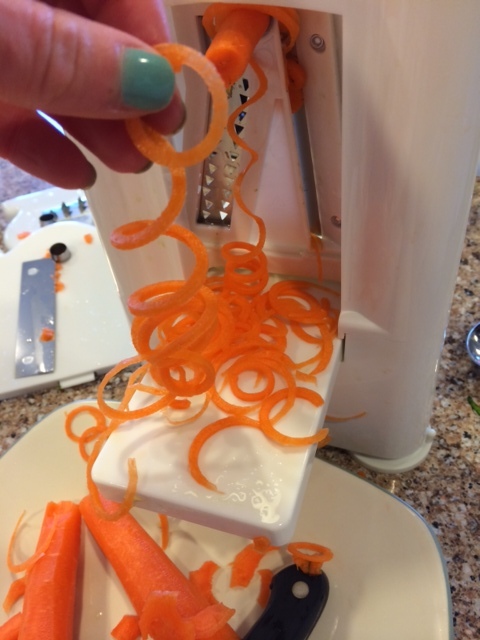 Let me introduce you to the Paderno Spiralizer. I have spent the last week (yes, it sat in the box for a whole week before I took it out) trying to spiralize anything and everything. I even thought about how I could spiralize Selby’s food, but quickly realized that was a bad idea and I might break it. I’ve been turning zucchini into pretty spirals the most, but have also used it for carrots and cucumbers. I used the zucchini noodles as a side vegetable, but I also used them as a pasta substitute the other night when I made spaghetti. So good and so healthy! I used the cucumbers and carrots when I made spring rolls! 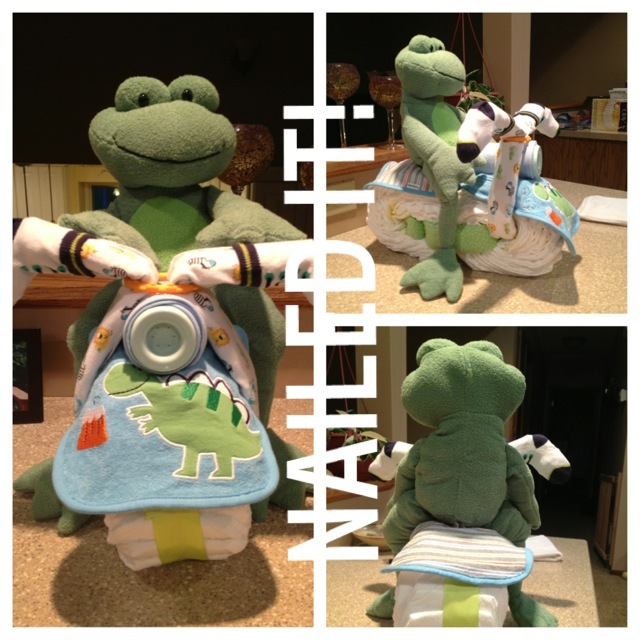 I was inspired to try them on my own after we made them at last week’s baby shower! Just commented last night how surprised he was since I haven’t stopped using it. And luckily it takes no time at all to spiralize a few veggies for the night or the week! Needless to say, this is my new favorite thing! You might want to check it out. If you have a favorite kitchen gadget, please share!!! And if you have some ideas for me on items to spiralize (I am pretty sure spiralize isn’t even a word, but I don’t care) share those as well! Did I really just take three-months off of blogging? No wonder I haven’t felt complete lately. I am not sure what exactly happened, but I can tell you that I have been extra busy lately. Surprise, surprise. Although some really fun and awesome things happened in the last three months, I won’t be recapping. That would just take too long. If you are curious where I have been and what we have been up to, visit me on Instagram @bettybshaw. The first recipe was found online at chow.com. I had tried cookies like this at a family event not too long ago and wanted to recreate them. Mix together the flour, baking powder, baking soda, salt, and cinnamon in a medium bowl, and set aside. Place the eggs and sugar in the bowl of a stand mixer fitted with a paddle attachment. Mix on medium speed until smooth. 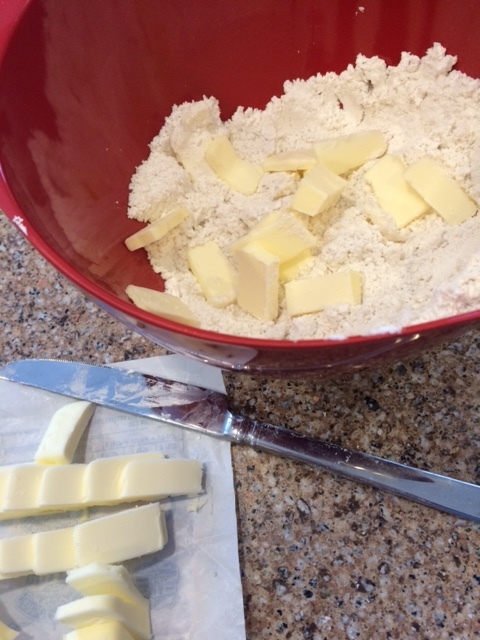 Stop the mixer and using a rubber spatula, scrape down the sides of the bowl and paddle. 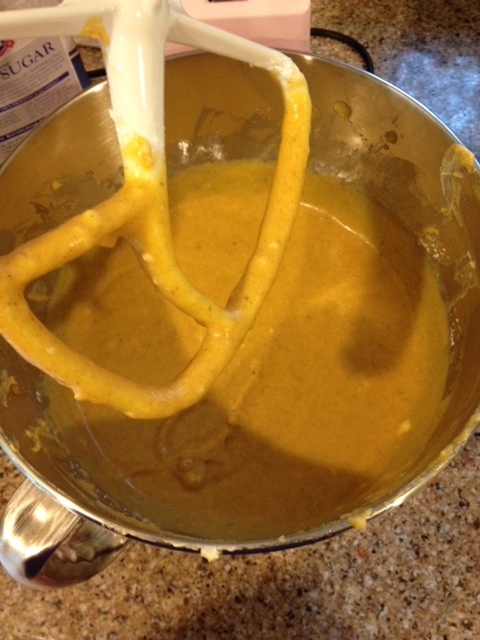 Turn the mixer to low-speed, add the oil, pumpkin, and vanilla, and mix until evenly blended. Add the flour mixture, and mix until just incorporated. Add in the butterscotch chips and mix until evenly distributed. Using an ice cream scoop (this actually worked really well!) scoop mounds of the dough onto the prepared baking sheets, spacing the cookies at least 2 1/2 inches apart. Using a thin metal spatula, smooth the tops of the mounds. Bake the cookies until the tops feel firm and a toothpick inserted in the center comes out dry, about 16 minutes. Cool them on the baking sheets for 5 minutes, then transfer the cookies to a wire rack to cool completely. 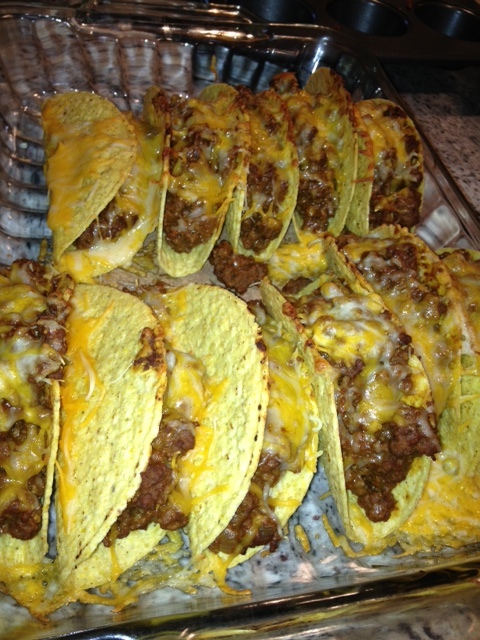 They looked a little different from the ones I tried previously, but turned out just as tasty!!! They are almost like cake cookies and super easy to whip up. Next up: Award Winning Ooey Gooey Pumpkin Bars. If I haven’t blogged about this before, I probably should start. 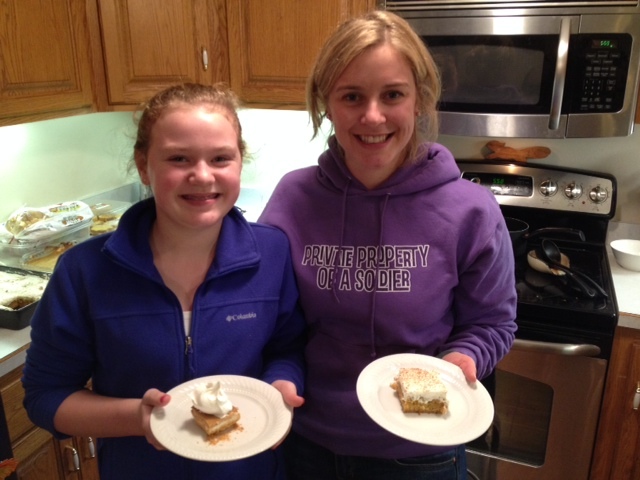 My 12-year-old neighbor and I often find ourselves in a bake-off. It is a friendly competition and she gets to set the terms of what we are going to make. In the past we have made banana bread and something lemon (we both ended up making a cake, but they were completely different). Although she is only 12, she is quite the skilled baker and beat me the first two rounds. When she text me and said we were on for Pumpkin Bars, I knew I had to bring my A game. Therefore, I went with a Paula Deen inspired (a.k.a. LOADS OF BUTTER) recipe. 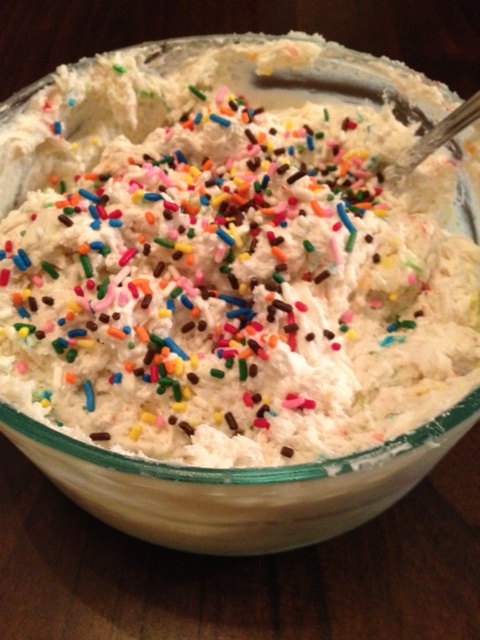 Combine the cake mix, egg, and butter and mix well with an electric mixer. Pat the mixture (this will take some effort to cover bottom of pan, but it can be done!) into the bottom of a lightly greased 13 by 9-inch baking pan. The Competitors: Erica and Me. Don’t mind the way I look, or the not so female strong sweatshirt I am wearing, but those were the finished product. Erica made a more pie like bar that included a yummy crusted bottom. After judging (our engineer neighbor on the other side of our house judges) he announced the winner and the reason why I can now call them Award Winning. 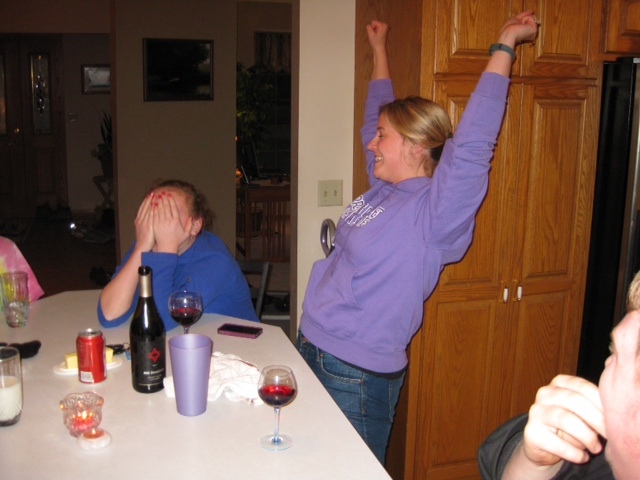 I may have felt a little shamed from the 12-year-old covering her face and the 28-year-old rejoicing, but I was coming off of two losses already. Cut me some slack. 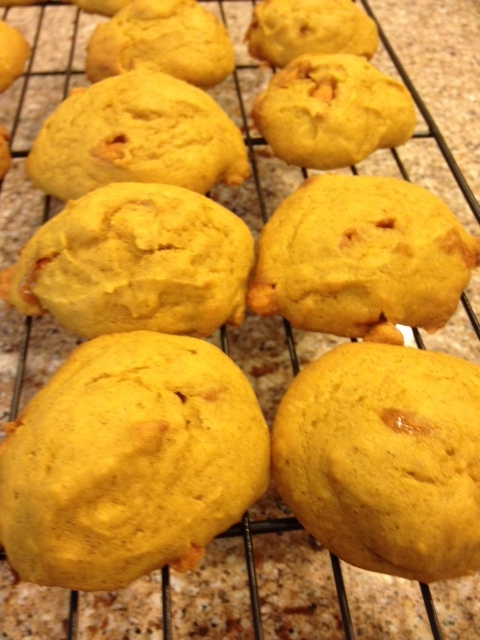 Do you have a favorite pumpkin treat or recipe for this time of year? 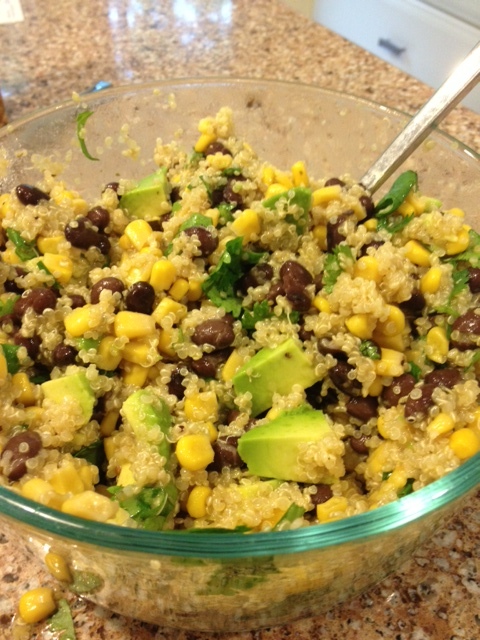 Remember that time in 2011 when I discovered Quinoa? Since I started eating the little protein balls I’ve been experimenting with different foods I can pair it with. Tonight, I bring to you a new recipe. It was originally found on Pinterest, modified by my co-worker Luana, and then made by me! Make Quinoa according to the directions on package. Once cooked, place in glass bowl and refrigerate. 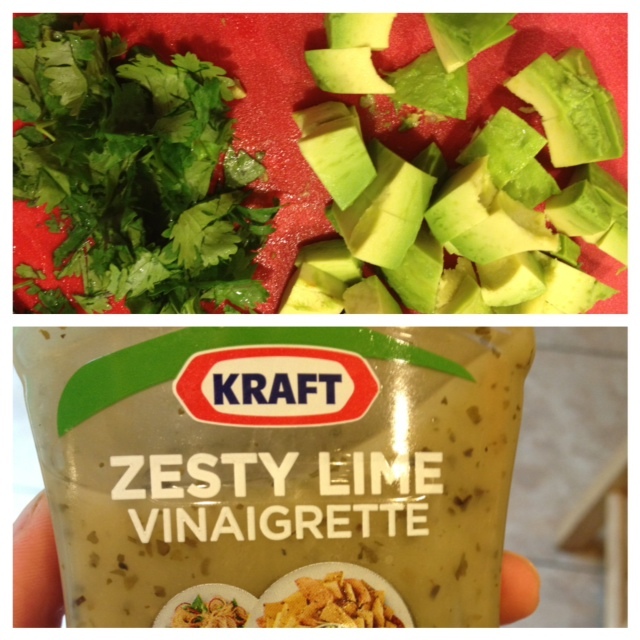 Once chilled, mix in the rest of the ingredients. Vegetables and vinaigrette can all be added to taste. I like to load mine up with veggies. Although Pinterest has been around for a while now, I can still lose hours and hours to it. Luckily, I have kicked the habit that was originally developing and now only log on once or twice a week. I have enough distractions in my everyday life to have let that one take over, thank goodness. I was, however, super psyched when a creative friend brought up the idea of having a Pinterest themed get together. We were planning to meet that upcoming weekend with another couple who recently had their first baby. 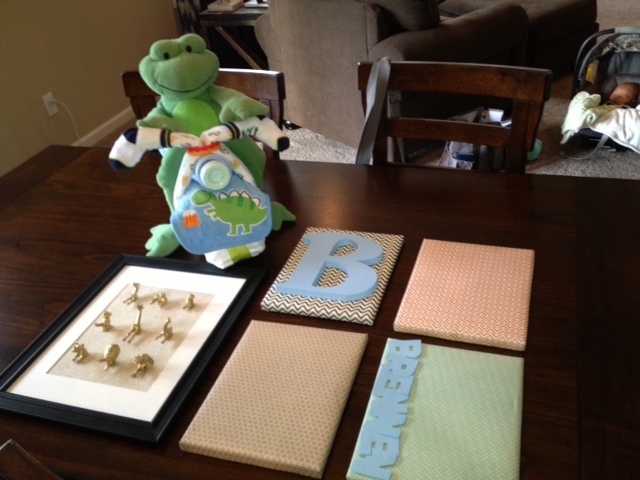 We decided that baby gifts had to be inspired by something seen on Pinterest, as well as the food consumed. 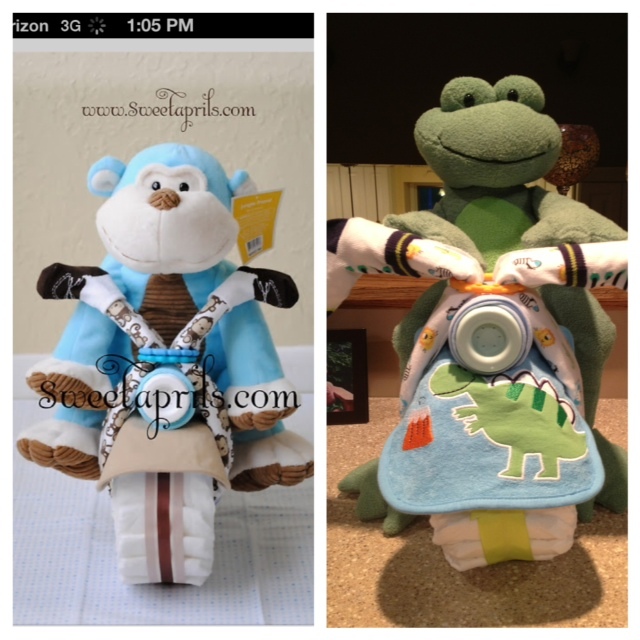 Motorcycle Diaper Cake is what I decided to attempt. I was super happy with the way it turned out! Needless to say, I think I did a pretty good job. And a Pinterest project can really go either way. It was pretty easy to make and you can find a step-by-step tutorial on Pinterest. Diane, my creative friend, made a DIY Canvas Art for the baby’s nursery and DIY Mounted Gold Animals. She noted that the Gold Animals turned out so neat she almost kept it for herself. It would look great any where, not just in a nursery. 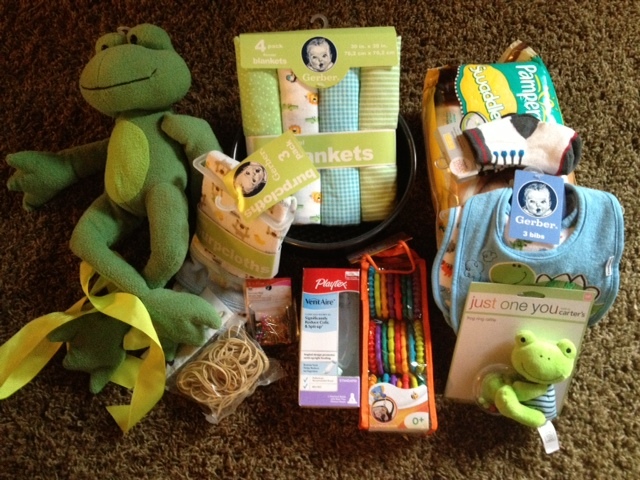 All of our Baby B gifts. And we can’t forget about the food. We had a lot of it so I will just highlight some of the best creations. 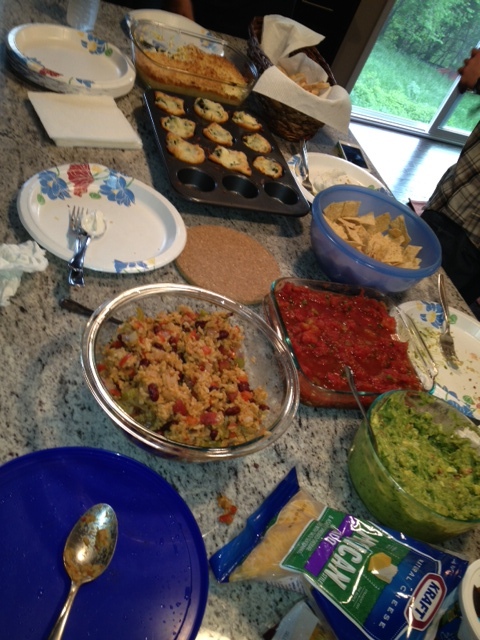 Diane made Baked Tacos, Lisa (new baby mama) made some amazing Guacamole, and I made Skinny Funfetti Dip. A table full of food and only six people, plus a baby. I’d say we had a super successful first Pinterest themed party, and I hope we have another one soon. 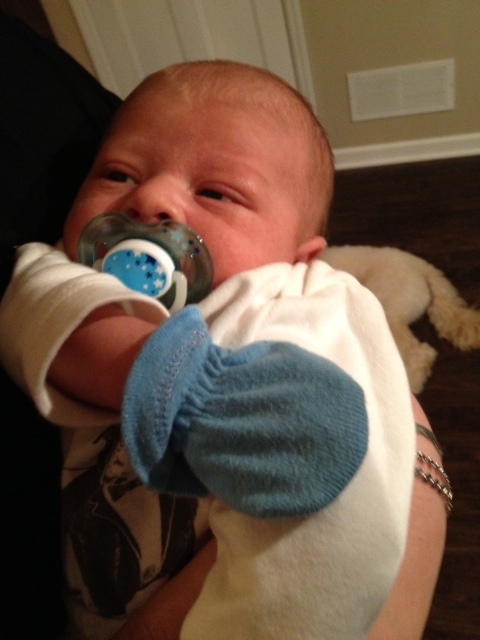 And just for good measure, here is a picture of Baby B. Truly the star of the party. Have you ever been to a Pinterest themed party? I can’t believe I haven’t blogged since Easter! Man, where have I been? I won’t bore you with a ton of details. I will just get straight to today’s post…Earth Day! I like Earth Day. For me it is a feel good day and a great reminder to treat our land with respect. It is something so many of us forget to do…me included. It also provides a great reason to attempt yet another thing you have found on Pinterest. Last night I set out to make some pretty amazing cupcakes I came across. I am doing my best to not consume everything I bake by myself so I thought I would share them with neighbors and coworkers. Little did I know, I was living with a cupcake fan that could rival my own love for them. This is how they turned out. A complete Pinterest WIN! Especially compared to my most recent Pinterest FAIL! I made them right before bed so I ended up leaving them on the counter to cool and let the frosting set. 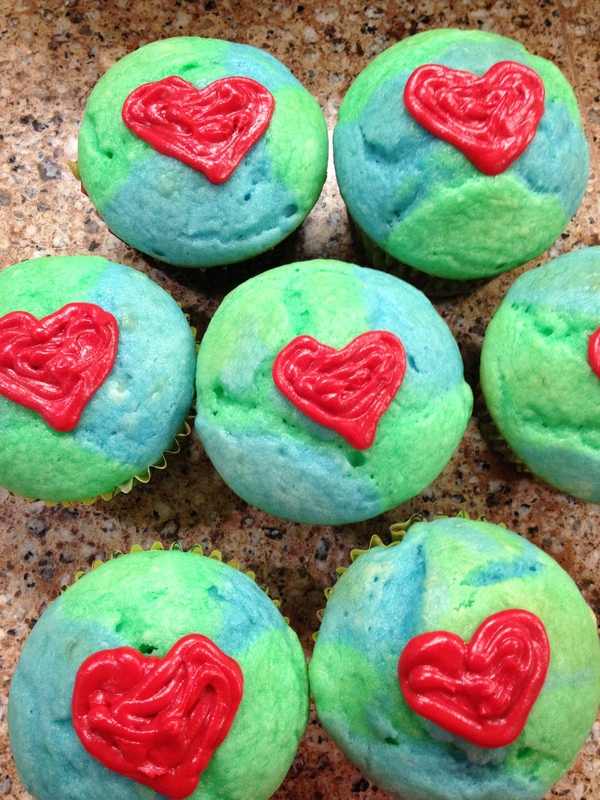 By the time morning came I woke up with a start thinking of my Earth shaped cupcakes. As I approached the hallway I saw something that resembled a ball…a ball that looked like an Earth shaped cupcake!!! I jumped straight for it and realized it was indeed one of my cupcakes. I quickly raced downstairs with Justin to find that half of my cupcakes were missing!!! Six in total. We honestly stopped and thought, “Wait a minute. Could I have put half of them somewhere else?” Clearly we were still sleepy. Then we found this. I recognize a cupcake coma when I see one. At first I was pretty upset. Then I kind of felt like this. We could not find where she ate them either. No sign of crumbs or cupcake paper. I brought what I could to work, but unfortunately couldn’t unveil my sweet cupcakes to everyone in my department because there wasn’t enough…AND they fell off my car seat on the drive in and totally got smashed. Some still risked it and enjoyed them though. Or so they tell me. I am still pretty new. 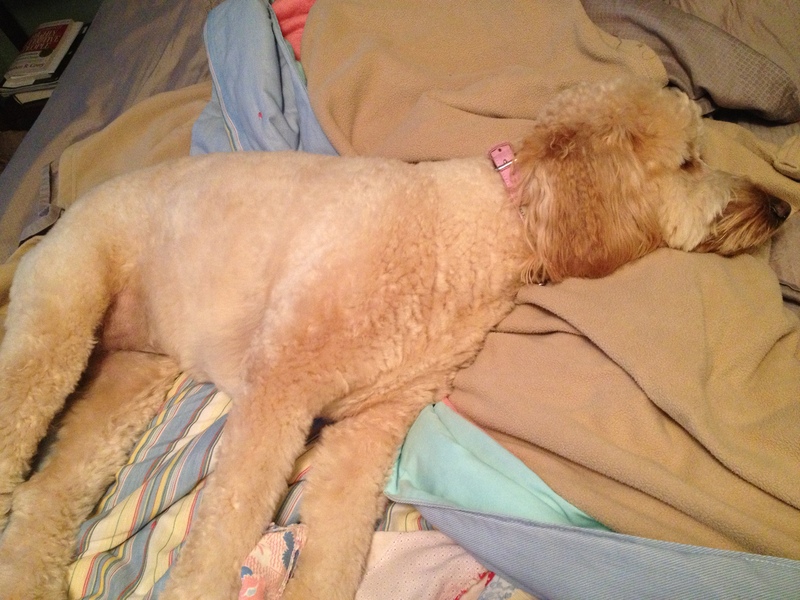 When I got home I encountered a very energetic puppy. Still on a sugar high perhaps? She didn’t get sick any where which was a relief. 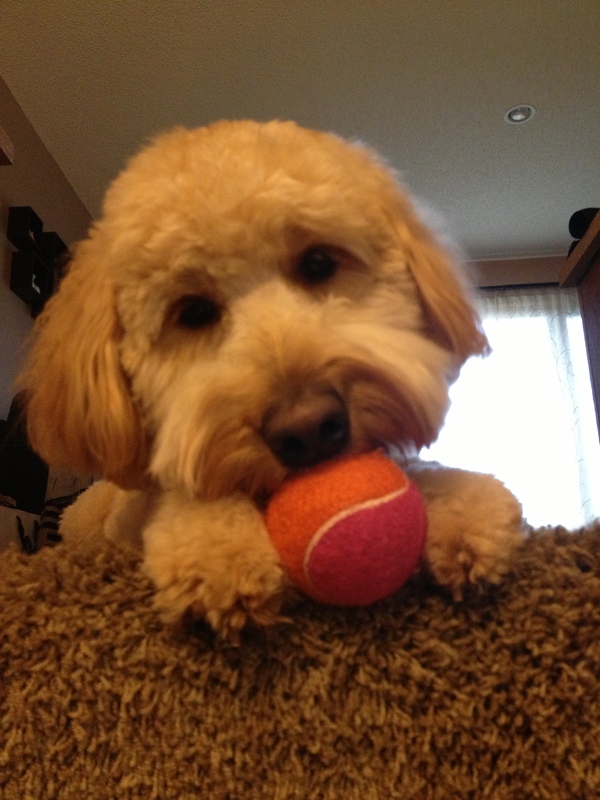 We played some fetch with her ball and she was looking awfully cute. How can you even think about being mad at this face? I felt bad leaving her but had to run to Stillwater quick. I was anxious to get back to my cupcake guzzling puppy and found this waiting for me. 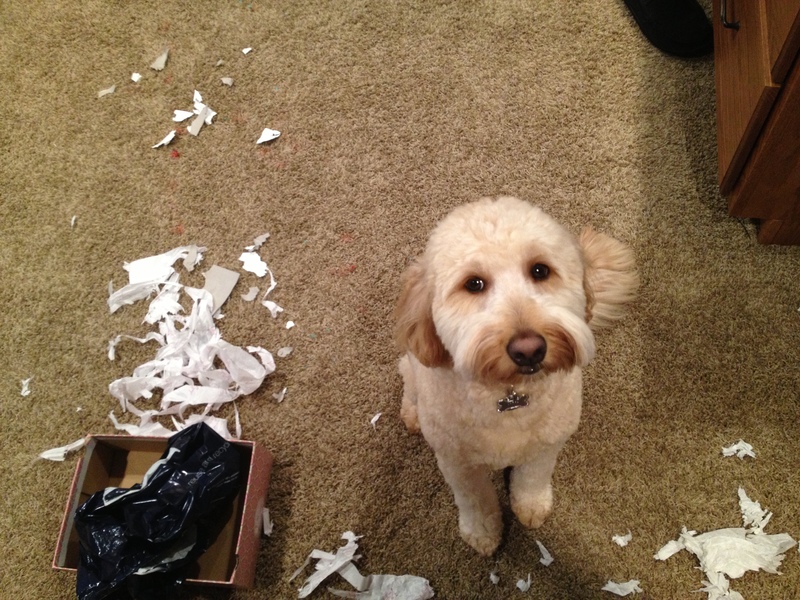 Has one of your pets ever eaten something you were excited about sharing? No sooner had I pinned this to try later and my friend Ashley was already blogging about it. The idea is: baking eggs, instead of boiling them. 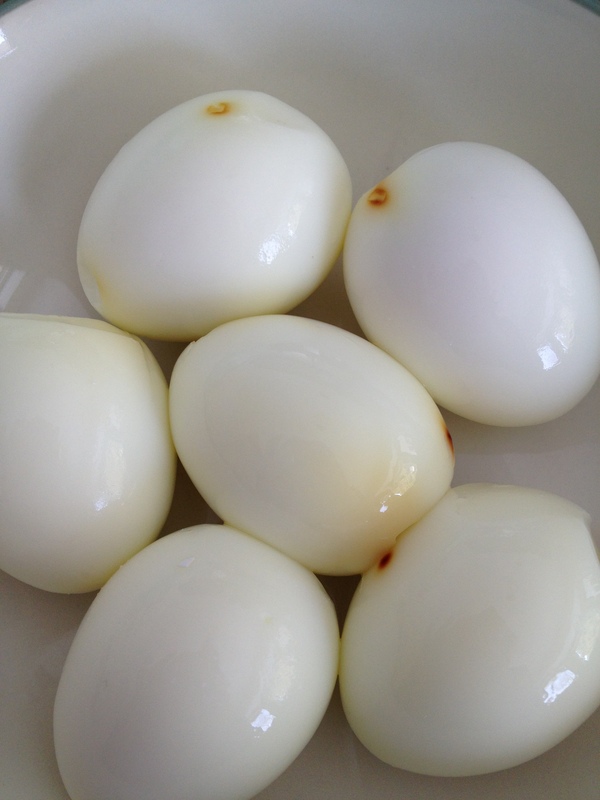 I am sure we have all struggled with peeling the shell off of a hard-boiled egg. Sometimes it can go perfectly and other times, well half of the egg comes with the shell. It is quite frustrating and makes you want to vow to never hard boil eggs again. Well, now there is a solution! Preheat oven to 325F. 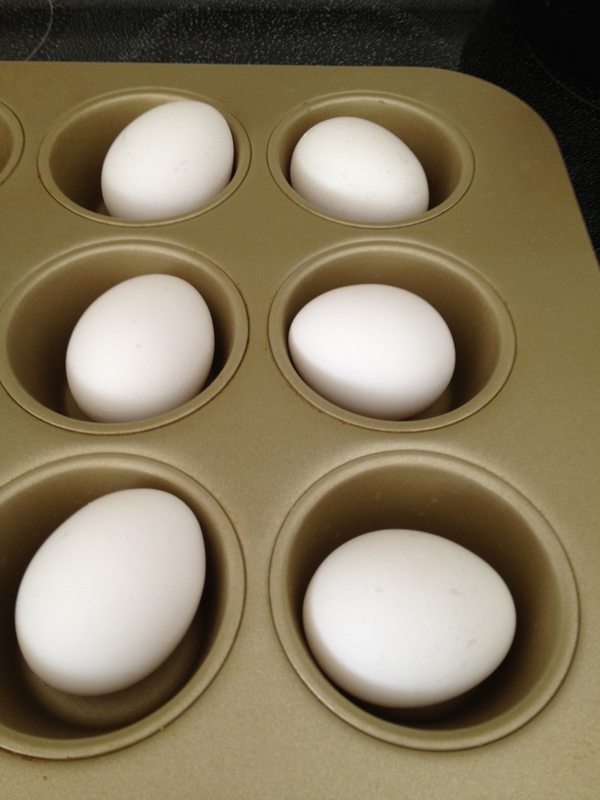 Put one egg in each hole of a muffin tin. This way they don’t bounce around and get lost in your oven. Baked for 28 minutes. 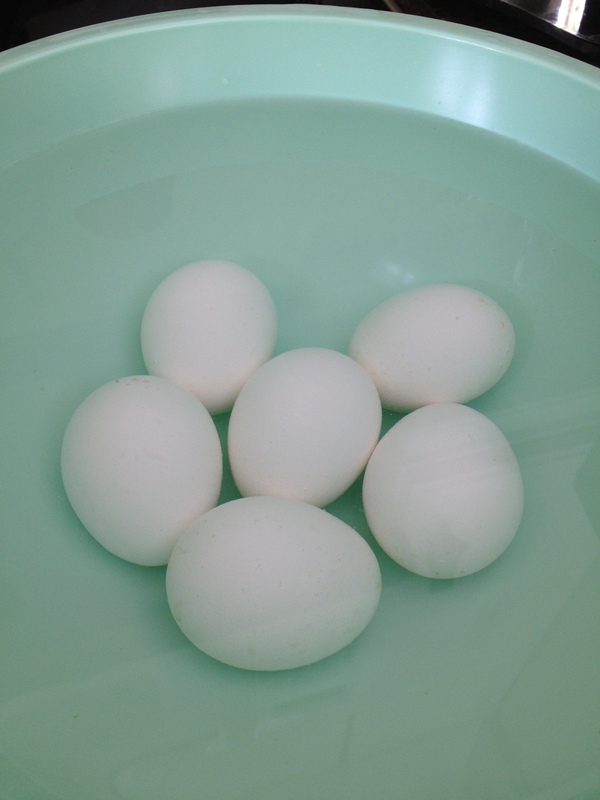 Once the timer goes off take eggs out of the oven and place into a bowl of very cold water. I used a spoon to remove them from the tin, because they are obviously going to be very hot coming out of the oven. I let the eggs sit for about 15-20 minutes. Once I thought they were cool enough I started to peel. And let me tell you, they peeled so incredibly easy!!! But there was one thing that was a bit wonky and unexpected- they looked like this. I thought I burned them. However, I consulted with the expert at Following the Yellow Brick Road, and she said that is how they are supposed to look when they are baked. Phew. I urge you to give it a shot and save a whole lot of time trying to peel the suckers! Have you ever tried something you found on Pinterest and it saved you a lot of time and effort?